Perka, a startup coming out of stealth and launching into the public today, wants to offer merchants a new spin on loyalty rewards programs in an effort to become the “antidote” to the 300-plus daily deal sites out there cannibalizing each other’s revenues and user bases. 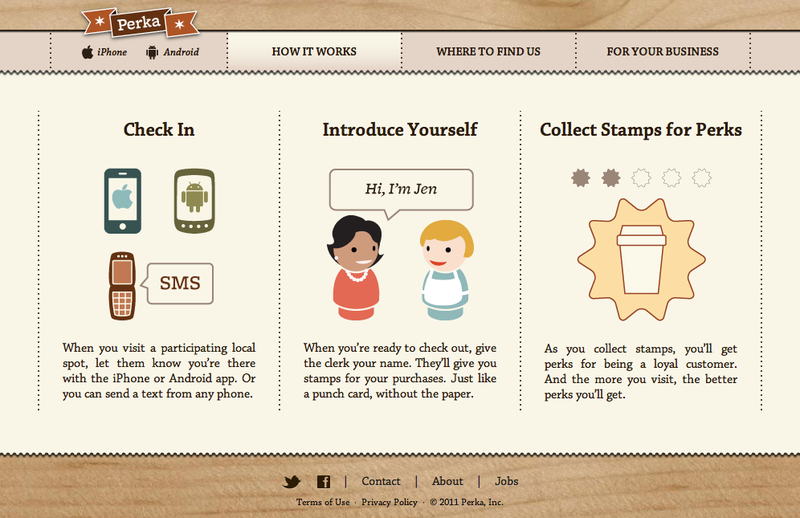 Perka is essentially bringing those “buy 10, get 1 free” punch cards we know and love online — and to our mobile devices. And, rather than just being another consumer-facing loyalty offering, the startup is looking to flip the deck and instead go after small, local businesses, as it looks to enable these merchants to effectively compete with the sophisticated loyalty programs of multibillion dollar companies like Starbucks and American Airlines, to name a few notable loyalty players. With Groupon, LivingSocial and the daily deals model, merchants are already offering a product or a service for less, but Perka wants to put a device in a merchant’s local store, providing an app for both customers and merchants to allows merchants to easily track purchases, and get to know and reward their loyal customers. On the other side, consumers get the benefit of being able to easily checkin to Perka on their mobile device from the store, or via SMS from any phone, to earn stamps in pursuit of rewards. Perka is hoping that by offering a simple solution and working individually, face-to-face with small local businesses, they will be able to convince merchants that Perka offers a better way to get at that much-coveted retention — to keep customers coming back. Through Perka, merchants can decide what they want to give away, how much, and how many checkins (or stamps) it will take for customers to receive rewards. When a customer comes into a store and checks in via their iPhone or Android app, using their Perka-enabled device (at this point an iPod Touch), merchants can see who their customers are, and that they are, say, $2.50 away from the $25 goal. The merchant can address the customer by name and tell them that with another small purchase they can get a free coffee or a coupon for a free massage. For merchants, Perka will cost $85 by way of a monthly subscription, which includes the addition of a Perka iPod at their cash register to validate customer purchases. Transactions are recorded in a centralized database, and a single registration allows members to participate in any Perka merchant program. The startup also will work with individual businesses to tailor their loyalty program to whatever suits their current needs, whether that’s to encourage repeat visits, improve sales of a particular product, or increase transactions. Merchants can run multiple programs through Perka, and include rewards for multiple products or services at once. What’s more, local businesses can sign up for free consultation with the Perka team to see if the service is right for them and how to best meet their goals, as well as apply for “Perka Pros” — on-site account managers who consult with merchant owners and managers, provide in-store marketing materials, design custom incentive programs and monitor results. Perka is launching its service in Portland, where the startup is based, to begin with and has already partnered with 30 partners in the Portland area. Over the next year, Perka’s team of 16 will roll out its services in another 20 cities and regions across the country. The startup is co-founded by Alan Chung, Rob Coury and Rob Bethge, all three serial entrepreneurs who count six exits between them ranging from $25 million to $1.5 billion, with buyers including Facebook (Zenbe), Aol, Sun Microsystems, and TD Ameritrade. The startup is currently bootstrapping, but has also recently begun talks on Sand Hill Road for its first round of venture investment, Chung told TechCrunch. The key value proposition here for Perka, in the long term, is its centralized database that tracks real customer purchases. Currently, there are many consumer web companies collective massive amounts of data on consumer activity, checkins, purchases, spending trends, and so on, but few companies have been able to easily tap into the actual real world, offline buying habits of average people at small, local merchants. This data can become an invaluable resource for local businesses looking to get to know their consumers better — just as it can be a highly leverage-able asset for Perka. For the startup to succeed, it’s all about providing a seamless setup and onboarding process for local merchants. From what I’ve seen, the process is just that. And because Perka only requires a few merchants to adopt the service (and sign up their own customers) to be able to create a useful network for local customers and participating merchants, it may just have a leg up on other services targeting local merchants, like Foursquare. And, hey, ePunchcard company Punchd was recently acquired by Google for $10 million. In terms of the mountain a loyalty program-focused startup has to climb, sure, only 12 to 15 percent of customers are loyal to a single retailer. But then again, that relatively small percentage of customers drives 55 to 75 percent of sales, according to Chung, so by reducing customer attrition by just 5 percent, a company can improve its bottom line significantly. Increasing that customer loyalty by just 1 percent equivalent to reducing costs by 10 percent, he said — something that will surely be of interest to local business owners. For more on Perka, check them out at home here or on the App Store here.